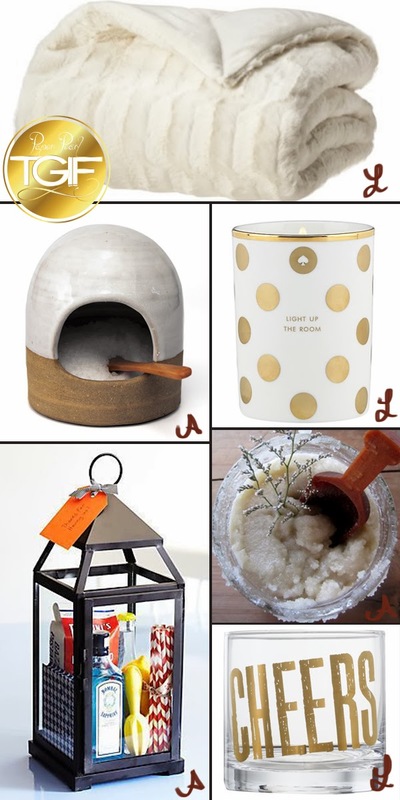 As holiday entertaining approaches Laurie and I thought it would be fun to find some hostess gift ideas. I love the thought of crafting gifts with my own hands but also know there isn't quite enough time in the day to always do that...I think our selection of homemade/handcrafted and fun pieces you will use and love but maybe never buy for yourself are awesome! Did anyone else notice how coordinated Laurie's finds are compared to mine? Very telling of each of us. Love it. I think giving someone items they can entertain with again is a great idea. Not only does it help them restock some items you know they might use, it also insures a return invitation to enjoy the items you gifted. Win, win situation for the hostess and yourself. Every hostess needs to pamper themselves once in a while...the homemade body scrub, aromatherapy from Kate Spade and plush throw can certainly help. Enjoy your holiday parties and be sure to thank your hostess!